My London Builders have some of the best painters and decorators in London. 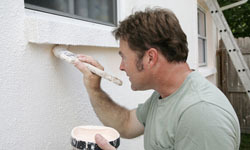 We provide first-class decorating and painting services in London, and will be happy to prove it. Our commitment to quality is reflected in the people and materials we use. We work with master craftsmen who share our passion for quality and focus on the needs of the client. To complement these skills, we only use quality paint and materials, to ensure the end result is worthy of our name. So next time you’re looking for painters and decorators, London or South-East England, call us for a free quote on 020 8829 0458. Essentially, if it involves a brush and some skill, we’re the people for the job. Our residential and commercial painting and decorating services cover almost all types of property, including homes, offices, shops, factories, hotels, bars and restaurants. No job is too large or too small. My London Builders has the people, and the tools for any job. Our professional painters can provide both internal and external painting services, including specialist finishes such as marbling. Other services and skills include wallpapering, including wallpaper stripping and wallpaper hanging. Surface preparation is a My London Builders speciality. The better the surface finish, the better the end result. So our skilled paint stripping and wall and wood preparation services are valuable assets! My London Builders supply painters and decorators to London and South-East England, so the next time your house or commercial property needs a tidy up or a makeover, contact us for a free, no-obligation quotation. My London Builders take care of everything. We prepare the working area, protect furniture, cover everything to avoid splashes, prepare surfaces, fill and skim if necessary and paint or wallpaper to an extremely high standard. We then clean up, remove the covers and return the area in the same condition we found it. We look after your property as if it were our own. We clean, prepare, work, finish, and clean again. Apart from a superb new look to the room, you would never know we had been there. We work fast and efficiently, but always do a good job. We keep disruption to a minimum and always leave the site as we found it, if not better. We take pride in our work and do everything we can to deliver on our promises. We turn up on time, keep to the schedule and ensure we deliver the finished product when we promised. My London Builders only regard a job as complete once you’re completely satisfied. Making you happy is our number one priority.